Home > Starting Out > What is Painting? Painting is a term applied to the deliberate application of paint to a surface, whether for decoration and protection of that surface, or in order to create an image upon that surface. Many attempts have been made since the late 20th Century to define what painting is, partly for the threat posed to painting by photography and film: That is to say that as photography and film so adequately represent images and movement in a way that paint cannot, painters began to reconsider what it is that they could do, that other types of artist can't do. This has led to a consideration of what painting is not, in order to better understand what it is. It is clear in this sense that painting is not photography, film, sculpture or performance art. It also does not belong to that category of playful conceptual art that can take any banal object and claim that it is art. From this simple deduction we find that painting is not adept at conveying a realistic image (like the photo), movement (as in film), three-dimensionality (as in sculpture) and real life action (as in theatre and performance). We are left, then with a medium that is unrealistic in its representation, still and flat. These facts account for the development of 'way out' painting forms such as Expressionism, Surrealism and Abstraction. In all of these forms the nature of paint is utilised to do what it does best. Paint can be used to express colour, emotion and a distortion of reality, and so that is what it tends to be used for. Another thing about painting is that it results in the production (like sculpture) of an object that can be owned and collected. This means that even paintings that defy what painting is best at and try and do something else (as with paintings that attempt to look like photos) can be much sought after for the value that people place upon them as art-objects. Where does this leave the individual painter? Firstly, it is important to realise that there are different types of paint (all of which are covered in related articles) and that each of these types have differing qualities. The effect that you will get will depend on the type of paint you use, the surface you apply the paint to and the implement that you use to apply the paint (be it brush, palette knife, hands or whatever). Whichever paint you choose (out of oil, watercolour, gouache, acrylic, and so on) you must realise that painting is a fluid medium, that flows unlike pencil or charcoal, and that this is a major element in how one applies and manipulates paint. This 'fluidity' allows for a range of subtle flowing expressions and accounts, in part, for the use of paint in conveying emotions so effectively throughout the history of art and iconography. Once this has been realised the painter can begin to experiment with the wide range of visions that can be expressed by adjusting tones, colours and brushmarks. The best way to do this is to focus on developing one area of painting at a time. For example, when dealing with colour, experiment purely with squares of colour, to note the impact that one colour has upon another. If experimenting with tone restricts your palette to just black, white, and the shades of grey that can be mixed with them. 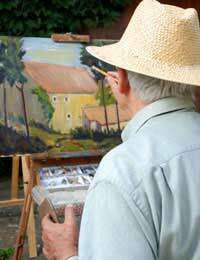 In doing this you will gradually build an understanding of the elements that make up painting.